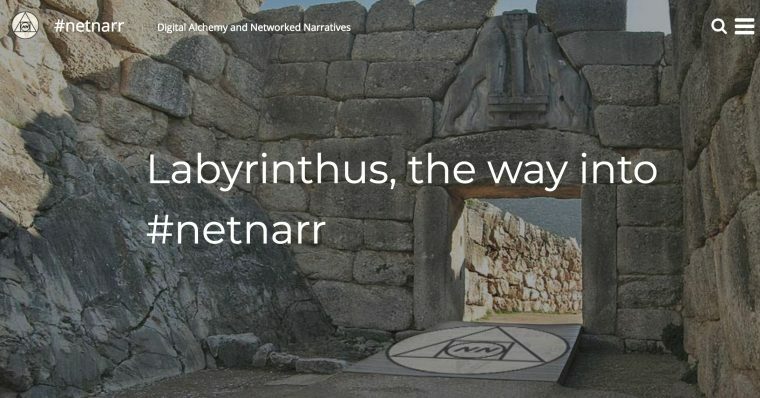 Since Hollywood movies are bereft awash with sequels, look out open course watchers; NetNarr returns to the internet screens next week, another feed syndicated open course don’t call us a MOOC blockbuster. Last year’s course where I (Alan Levine) co-taught from afar to a class led by Mia Zamora at Kean University was one of the best teaching/participant experience I’ve had. Where on top of other things, I surprised class by showing up in person for the last meeting. This led to a number of things including a presentation at 2017 DML Conference. It also led to, because my partner and colleague Mia Zamora accepted an invitation to be a Fulbright Scholar at the University of Bergen, for me to take over the role of a MA thesis advisor for five of our students. It also meant I would teach the Spring 2018 version of the same class at Kean, solo. From afar. The course will be different on many levels, and has been listed as a different course so students can take it again (will they sign up for a sequel? Half the new class are returners). Two of my previous students are taking the course and also acting as my class TAs. 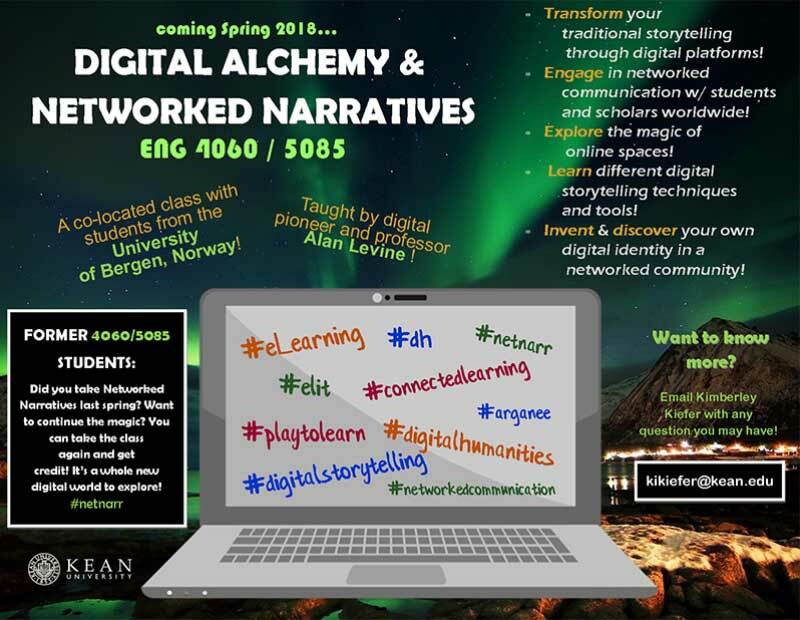 The new course is “Digital Alchemy & Networked Narratives”. I’m working in parallel with Mia as she has a 60+ student class she is teaching in Norway, and our plan is to create overlaps and connected activities. This time around we aren’t taking trips to Mirror Worlds, and the month of Studio Visits we did in 2017 will be spread out through the course. The overarching/interwoven theme is (I am borrowing from a discussion with Jim Groom) This Digital Life— an examination of the workings and impact of digital technologies on our lives, as individuals, as communities, as society. I want to increase an understanding of how some of the less obvious layers of the web work (e.g. tracking and adtech), hopefully some of Mike Caulfield’s Digital Polarization activities, but also have students think, and project about what all this means. Part of the “digital life” theme is then a class taught by a professor himself mediated by digital technology, as I will be a presence beamed in a wall in class (no surprise this time, I am announcing I will be in campus May 3). I’ll be aiming to offer the first hand experiences of networking in our usual array of twitter (yes toxic) and syndicated blogs. I also want to make regular intensive use of web annotation via hypothes.is. We’ll be looking at these issues through the three genres Mia is covering in her class; Digital Art, Gaming, and Electronic Literature. My aim is to address the Digital Life questions through expressions and interactions in these genres. And we have a third major part of the network when we do the gamin session, is to also connect our activities to a gamin class Maha Bali is teaching in late February – into March. 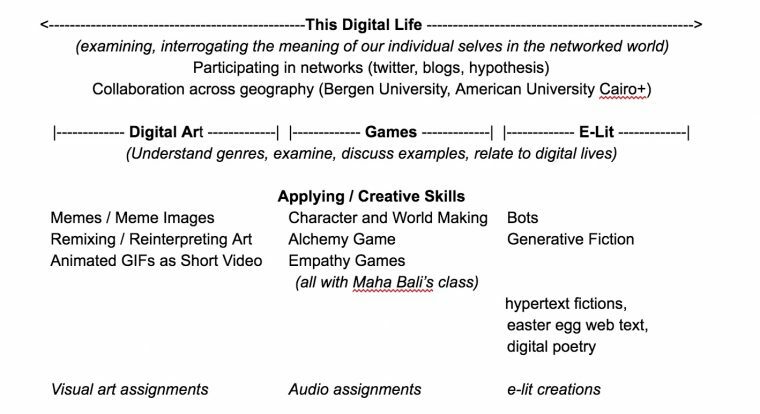 I also have a media skill building layer, where my students will learn and use visual art/photography tools for the Digital Art Segment, audio editing and production skills for the Gaming One, and creating with electronic literature tools in the third segment. There will again be a new series of Daily Digital Alchemy (aka DDA) activities. I’m also building in a student activity, for each of the three genres, to contribute to a document of annotated references for the topics studied. My graduate students will be responsible for organizing and promoting this activity. And the final projects will be published in our new, self hosted, open is as open does Arganee Journal. Well I have it largely in my head and scribbled in a messy Google Doc. The class is open, of course, meaning, people who want to jump in for all or parts can do so, and they can connect blogs to our site (or not), tweet with us (or not), and annotate with us (ditto). There will also be some live Studio visits this time with practitioners of digital alchemy; the schedule is being finalized, but it looks like for the Digital Art one we will visit web documentary maker Brett Gaylor (after our students experience a bit of his production Do Not Track) and also a digital artist from Harvard, Emilio Vavarella. We will have live twitter chats and likely some Web Annotation storming. The announcements for the week’s activity will go up on the NetNarr site on Monday of each week. My classes meet Tuesdays, 4:30PM – 7:15PM ET (check your local time). Quite often we will do a live activity. This is a quasi, Choose Your Own Adventure game, where the adventure is setting up/deciding which to use for twitter, hypothesis, and your blog. The walk through is aimed at getting you all the info you will need to connect/reconnect your blogs and accounts to the site. Where do you do that? You need to explore the Labyrinthus. I have an idea to create some kind of activity, API laced dashboard, for each person that provides info on their activity in all three platforms. The lights will be on for a while in the NetNarr Laboratory, I hope you might be interesting in coming inside the alchemy lab with me and my students. Featured Image: Pixabay image by Kincse_j shared into the public domain using Creative Commons CC0. 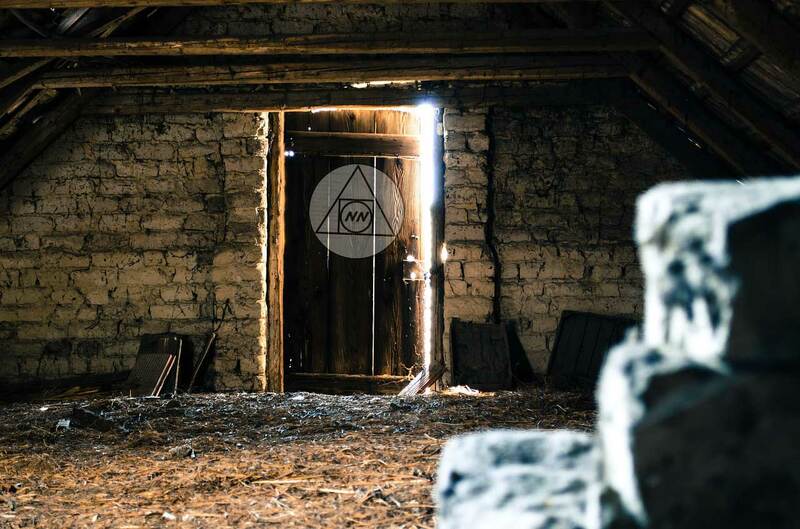 Modifications by me include layering the Networked Narratives logo on the door.